Step 1. 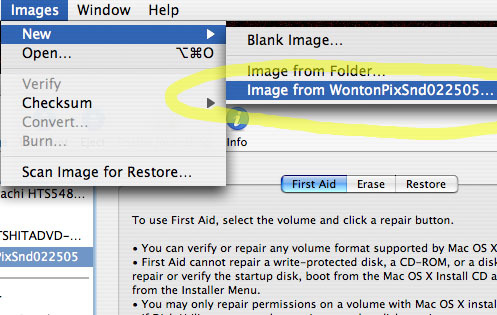 Put in your original disc and run Disk Utility from the Utilities folder inside your main Applications folder. Step 2. 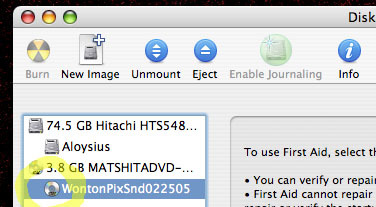 You’ll see your CD or DVD appear on the left-hand side of the Disk Utility window. Click on it. Step 3. Go up to the main menu and choose Images / New / Image from (name of your disc). Step 4. 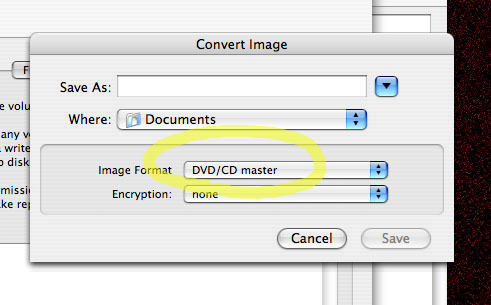 Choose DVD/CD Master as your format, and then save it. Step 5. Change the new file’s extension (the abbreviation with a dot and three letters that tells you the file type) from .cdr to .iso. This will make sure that Windows and Mac programs alike will be able to tell what it is. Step 6. The “image” you just created isn’t a graphic; it’s a disk image, an exact copy of your CD or DVD saved on your hard drive. Instead of having to copy the disc by sticking in the original each time, you can burn a fresh copy in half the time by running Disk Utility, clicking the Burn button, and loading your disk image. 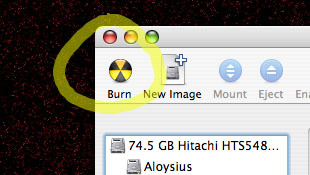 See here for more detailed Mac and Windows burning instructions. [WORDPRESS HASHCASH] The comment’s server IP (93.130.33.2) doesn’t match the comment’s URL host IP (85.25.46.163) and so is spam.